I thought you might like to take a little tour of an ensuite bathroom I designed recently. It was rather a pleasure, as my client wanted something with a bit of sparkle, which of course is a fun premise from which to create. The bathroom was being newly built as part of an extension, so we had no existing plumbing layout to conform to, however there turned out to be obvious places for all the different elements in the room, once we’d allocated the shower area. Whenever you’re thinking about a bathroom design, try and go for the largest possible shower space. It’s no fun bumping your elbows on the screen at every turn, or having to undertake extreme manoeuvres simply to apply your shampoo. The position of the doorway to this room carved out a clear area behind it for the shower to run along a side wall. After looking at a few walk-in screen options, and considering the splash potential, we decided to section off the whole thing with a flat sliding screen door. Once we had sorted out a location, we decided to line the shower area with some rather glamorous bronze-toned tiles from Walls and Floors. 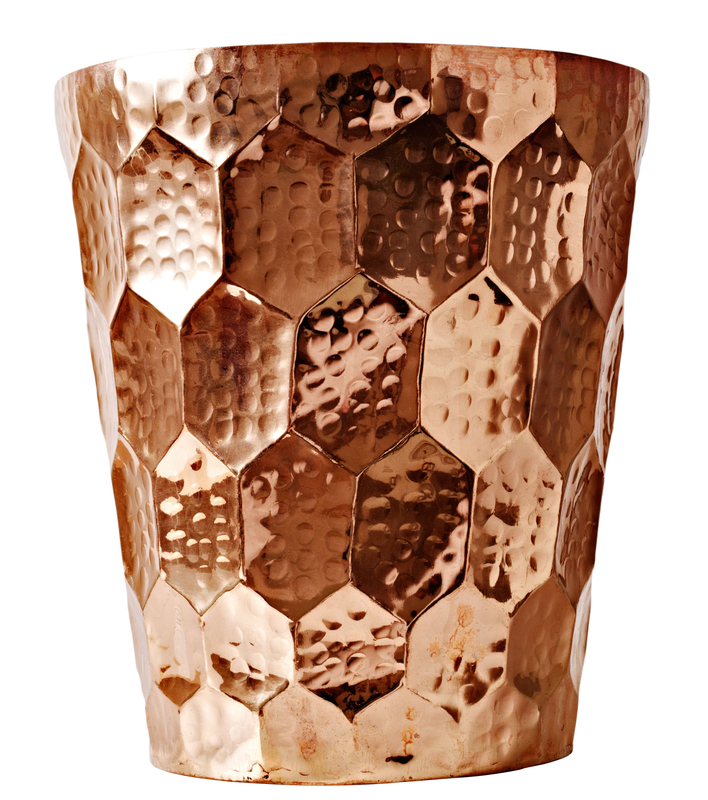 I don’t think this warm shade is in stock at the moment, but they’re from the Metalico range by Envy (their silver tile also looks rather glitzy, and for the dramatic, there’s a glamorous black one). There is a huge range of prices for shower kits on the market. You don’t need to pay a great deal for something that looks impressive however. 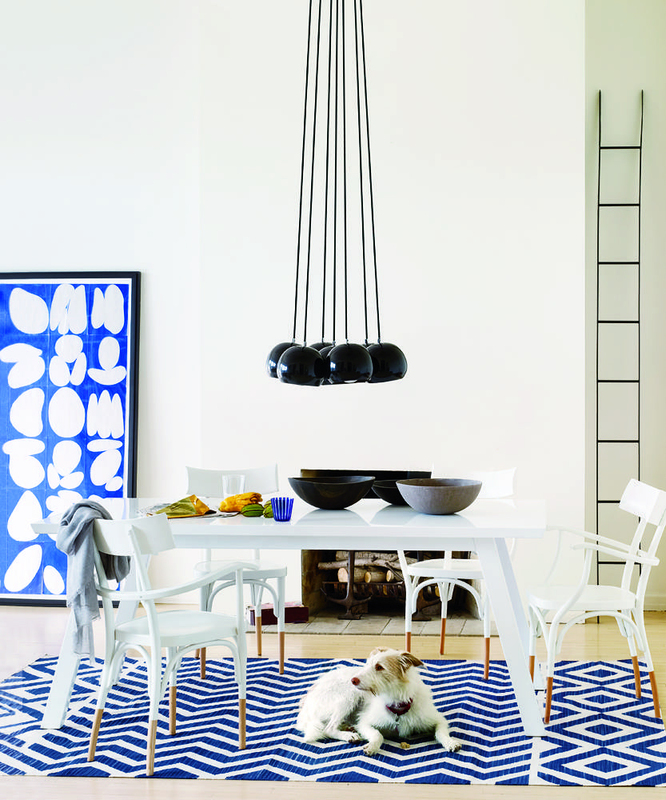 Keep to some simple guidelines and you can get the wow factor for less. Firstly, hidden workings can look swish, but tend to cost you more. The kits which have the workings (usually a horizontal bar) which control the thermostat on display are the most cost effective. Hidden workings need to be hidden, so often necessitate the creation of a false wall to hide them behind. And if things do go wrong further down the line, there’s a whole lot more excavation to get at them. Whereas if you need to replace your bar controls…. just swap them in for a new model. 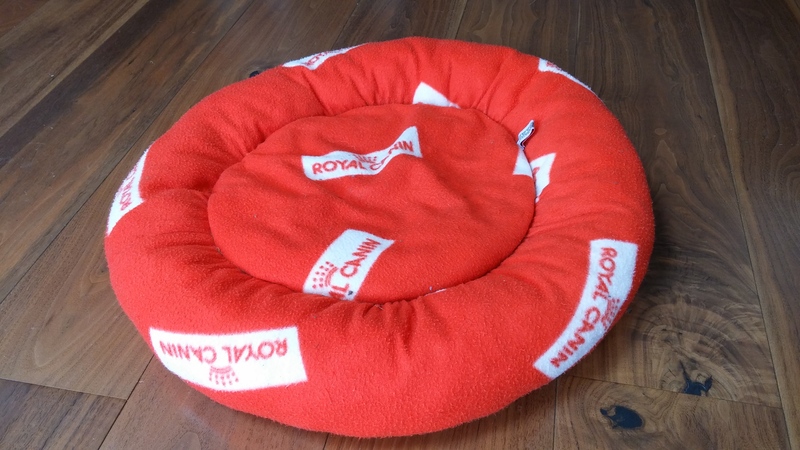 I often recommend clients to go to some of the trade-priced online stores for best deals on these. Plumbworld have often proved to offer a good selection. The one I sourced here is from Victoria Plum. One of the best way to dress your windows in a shower or bathroom is with a wood-effect blind. The material is a composite plastic created to look like a wood slat but with none of the inevitable warping or mould growth. 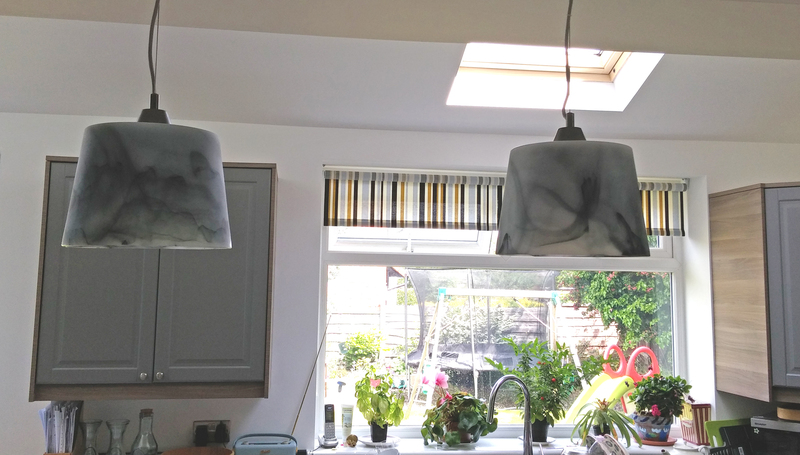 These dark wood effect blinds from 247 blinds are inexpensive and can be rotated shut for total privacy, turned to allow the light to filter through, or even drawn up completely. It’s always nice to fit in a little storage to a bathroom if you can. The space around a sink is obviously an ideal opportunity, and there are some lovely modular units out there in pretty much any colour or shade you could imagine to fit your look. We decided to go for a dark brown wood drawer unit, which looks neat against the white ceramic, and complements the copper-themed tiles. On the wall, a mirror can serve as the door to more shelf space, and this nifty cabinet also has a socket to plug in shaving equipment or toothbrushes. The lights running down each side are LED with a warm glow. 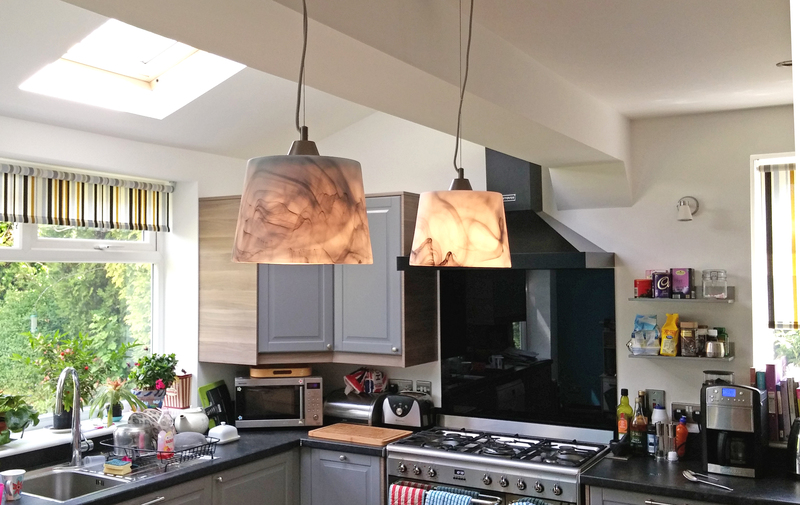 Perfect for ambient lighting on those tough early mornings…. Of course, the simplest splashback for your basin would be a couple of extras from the shower, but we wanted to liven up the look of the room, and found these delightful mosaic groups at Walls and Floors. Featuring hints of copper, greys and some jaunty patterns, these characterful tiles come as a set of 30cm-square designs which are ridiculously easy to fit. 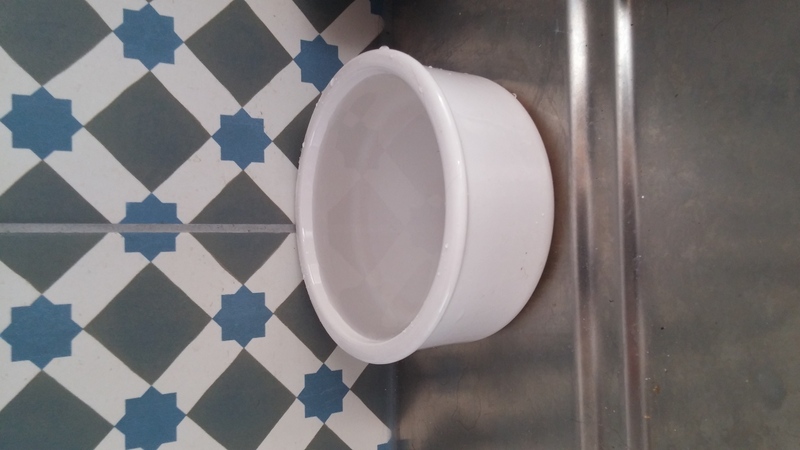 Two here span the width of the 60cm-wide basin. With the subtle glitz from the tiles, we kept the walls white and used a light grey-brown wood effect vinyl plank for the flooring. Whilst brown is the dominant colour here, the room seems cheerful and fresh. Just a little glitter can make all the difference. Let me know — what colour schemes would you consider for a bathroom? Do you prefer cool blues or natural tones of stone or wood? Some striking colour like green or red, or maybe a haven of grey? 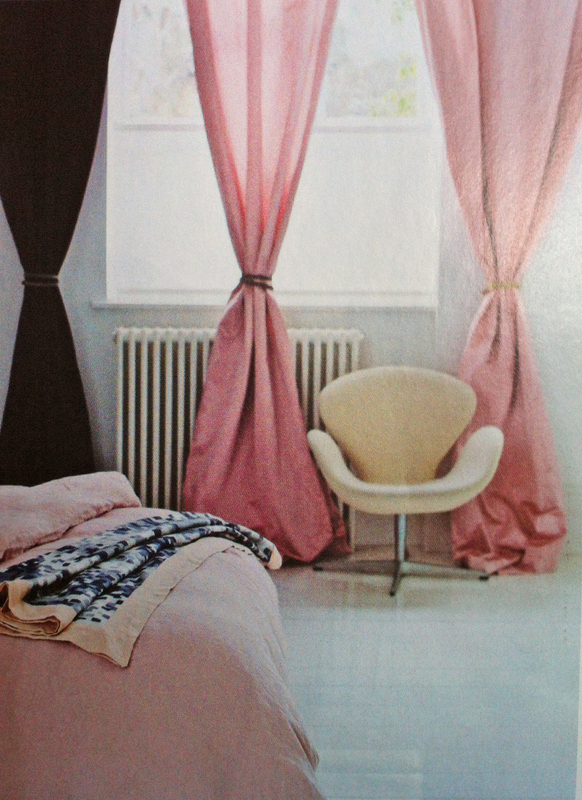 Do you like to add a touch of glamour in your fittings, or keep things muted? It’s always exciting to see a design come to life. 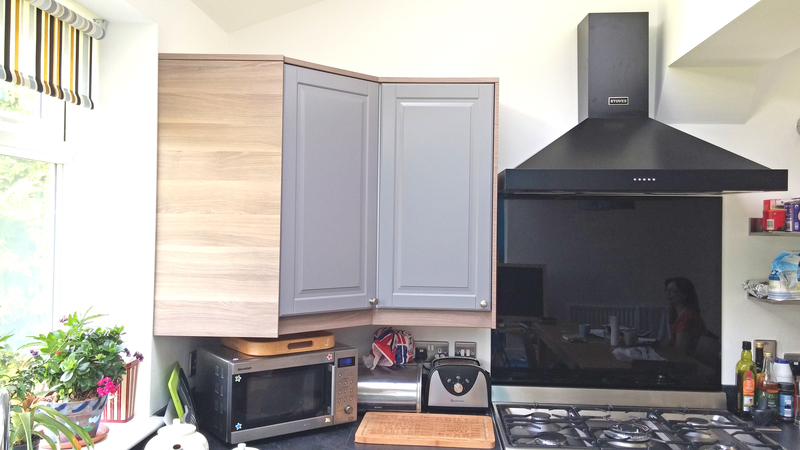 A few weeks ago I popped round to Holly’s kitchen to see how she was getting on now everything has been built and installed. You might remember our neat little pairing of Bodbyn grey and Brokhult wood-effect which I told you about in pick and mix — now they’re nestled together and established, and it’s time to show you the results. 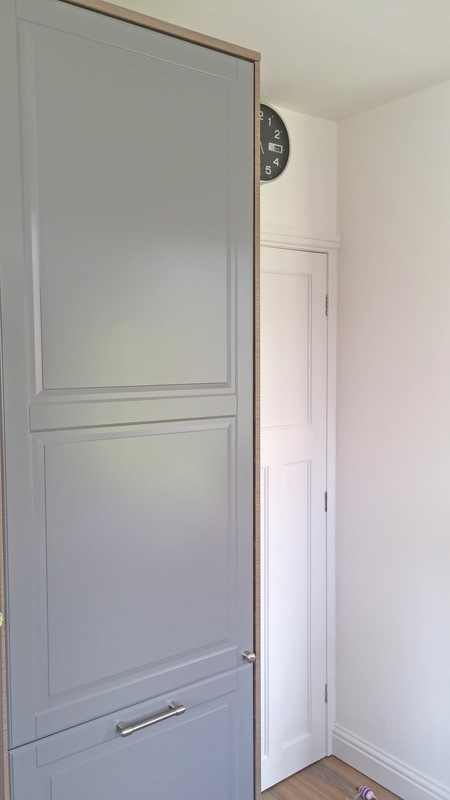 As you might remember, we chose grey for the doors and drawer-fronts, and end-panel pieces in faux wood. 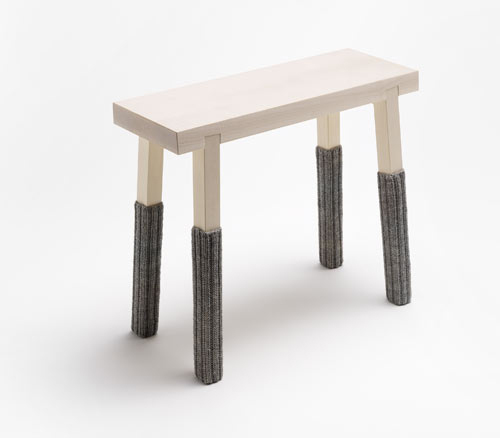 The wood brings a warmth to the mix, and stops the grey from feeling too stark. 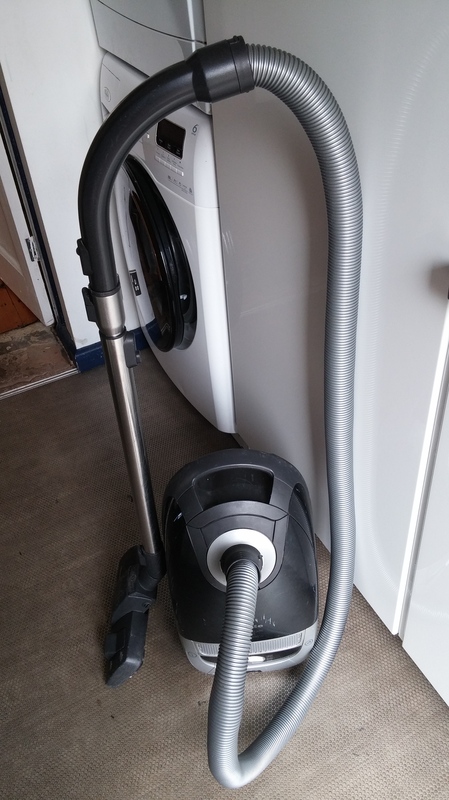 A tall cabinet is a great home for those extra items you don’t always allow space for: broom, mop, even the hoover. This one fits snug between a wall buttress and a door. Cheaper than getting a carpenter to build the cupboard from scratch, and with all the useful internal fittings that come with Ikea kitchen units. 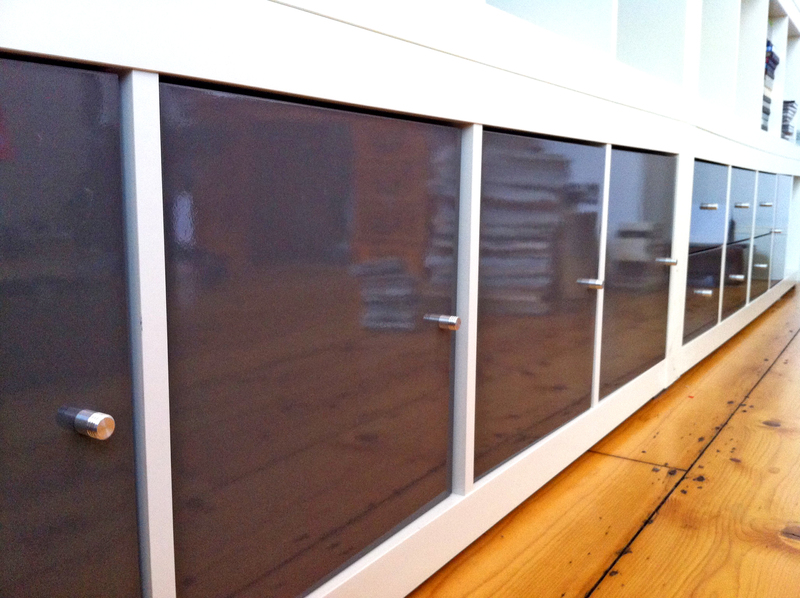 The contrast of materials is best displayed in the wall of storage we created to surround the fridge. In expensive high-end (modern rather than traditional) kitchens you often get a block of cabinets encased in a framework of eye-catching wood. 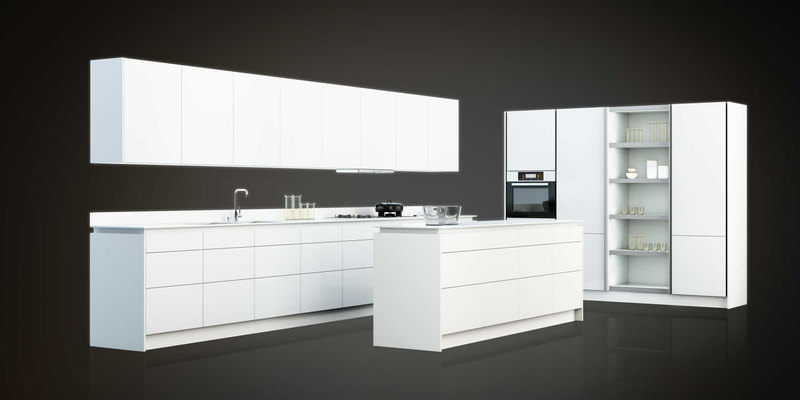 You can recreate this effect with Ikea units by using either side panels and a top cornice, or for a more chunky wraparound, re-purpose a ready-made wooden worktop. 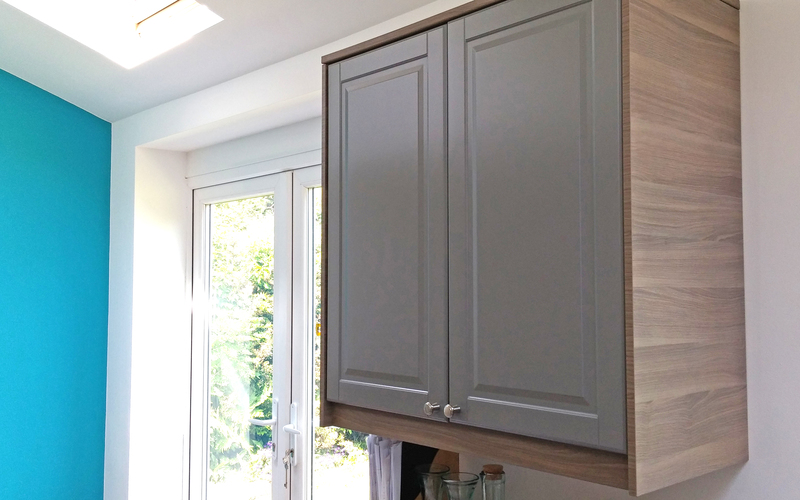 Here in Holly’s kitchen there was a limited amount of space between the doorway and the window wall, so we chose to maximise the storage options and go for the slimmer panels. 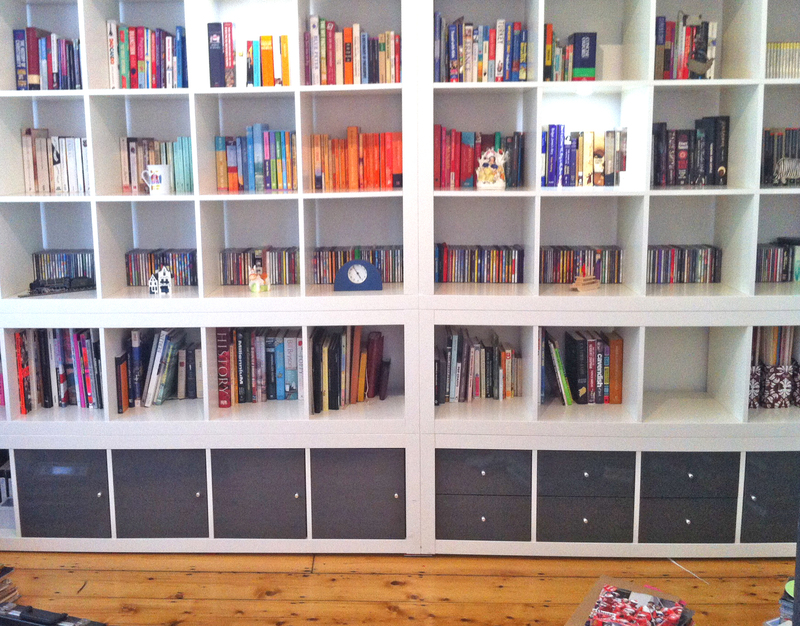 The neutral shades of the cabinetry meant that we weren’t trapped with one colour scheme for the room. 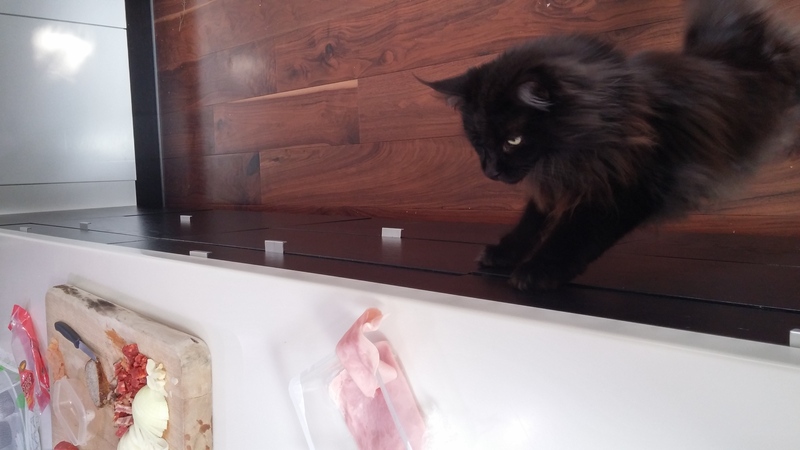 Holly opted for a slate-effect worktop, black cooker hood and a gleaming black splashback. 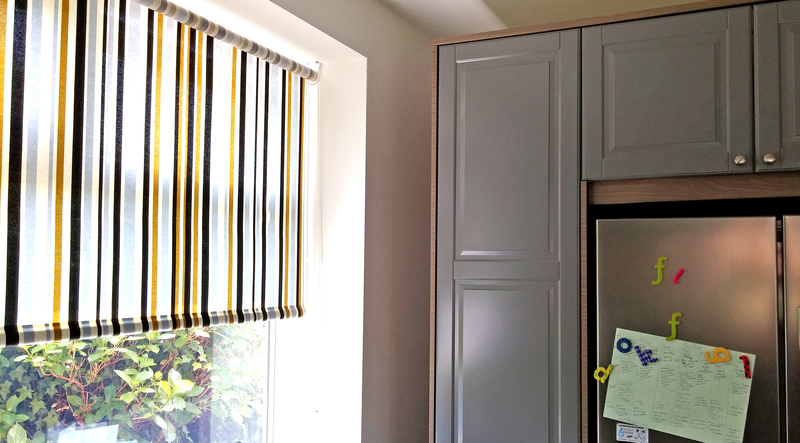 In contrast, the blinds are a perky deckchair stripe in mustards, greys and whites. The windowsill above the sink lends a cheerful aspect onto the garden — plants thrive on both sides of the glass. 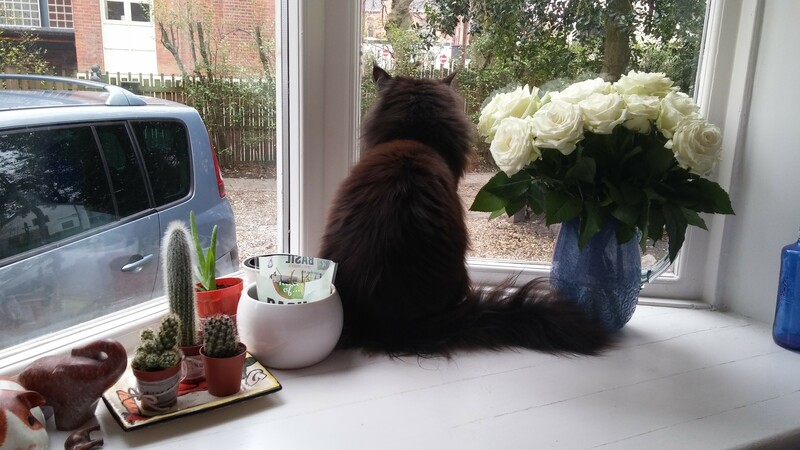 Showcase your shrubs – what kitchen windowsills are there for. 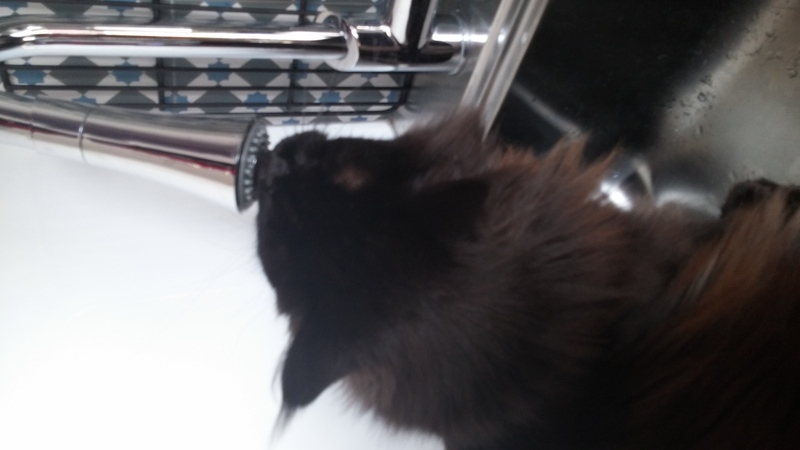 Tap is called ‘Palazzo’ from Mayfair. Most of the walls are painted white, but this feature wall in a bright teal brings a colourful jauntiness to the room. 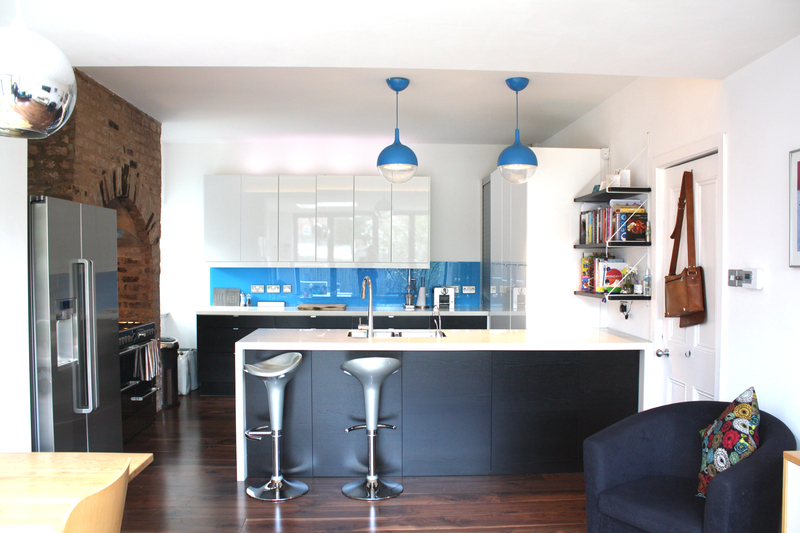 This kitchen has come together in a vibrant way, full of personality and warmth. I love the way the cabinet pairing works — and that Holly didn’t need to spend a fortune to do it. It’s made me wonder what other excellent combinations you could create if you think just a little outside the box. It’s certainly worth exploring beyond the suggestions presented on the pages of a catalogue or in basic showroom designs in store, and see where these ideas take you. Who knows what bespoke discoveries you might dream up! Hi, it’s Lotus, cat-blogger, back in the guest spot for one day only. It’s been a while, and I’ve watched you all deliberating over worktops and flooring materials with your flawed human logic for long enough. 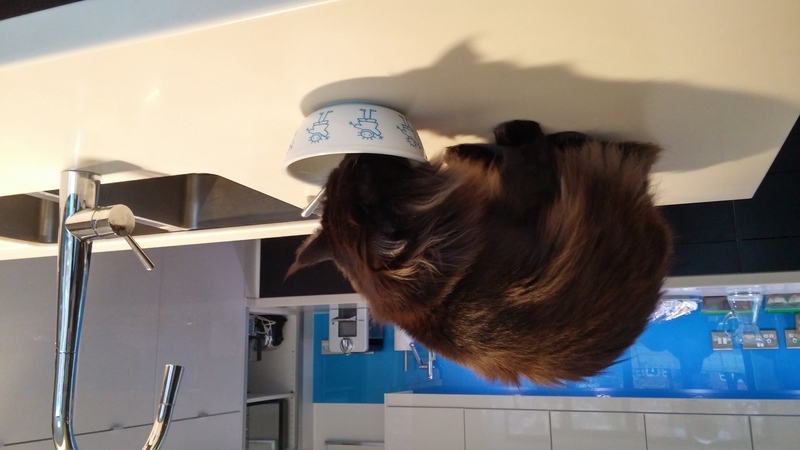 So now I’m back with some feline design tips that will leave you amazed and astounded. And hopefully a little better informed for next time. and Greek Style yoghurt. ‘Stealing’ is such a disappointing word. I think we could work on our semantics and switch to ‘rightfully claiming’ instead. Who knows what’s lurking in there? 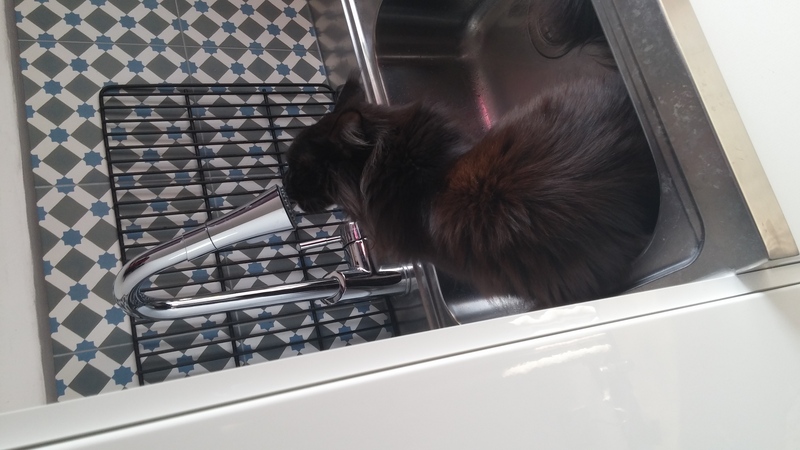 is never going to be an acceptable source of water. I can tell just by looking at it that you have laced it with something. Even though I just saw you fill it up from the tap (on which complex subject, read on). What are you waiting for? 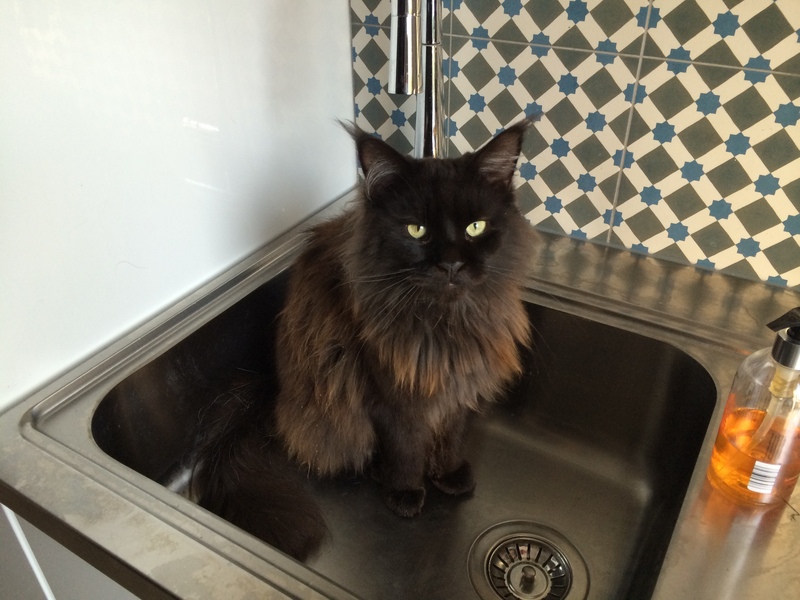 Turn the tap on, please, human. any glass of water left sitting around, and the shower tray, with its soap residue chaser. 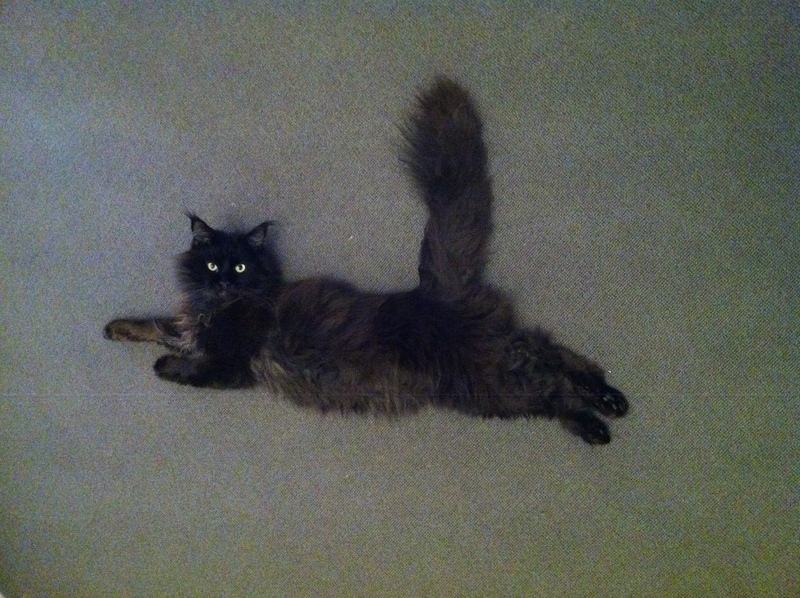 One of your better decisions has been the installation of this lovely grey carpet outside your bedroom. 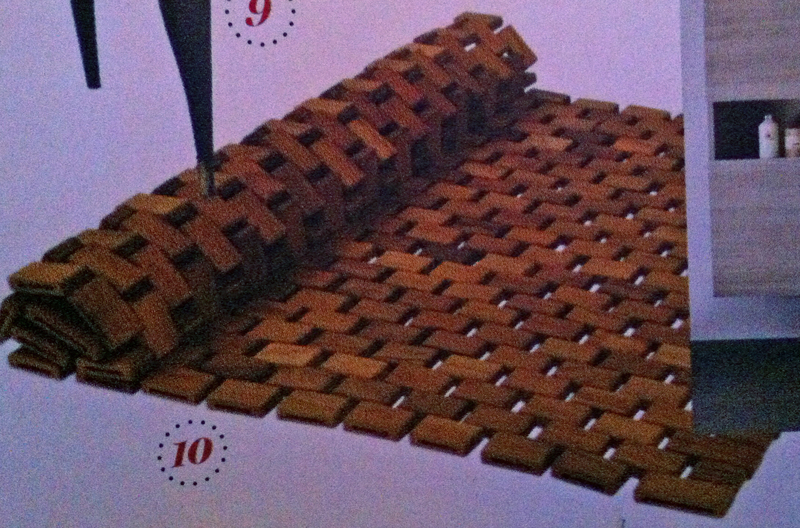 A loop weave is perfect for claw-maintenance schedules — well done. 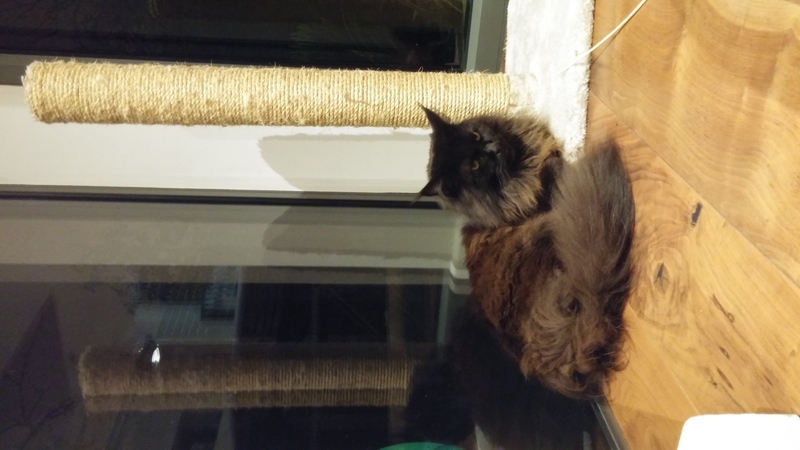 You want my opinion on the scratching post? I’ve noticed of late that my viewing platforms have been cluttered up with unstable and possibly dangerous items. Please refrain from storing your pointless belongings in my space. Some of us have a job to do. And finally. I go to a lot of trouble collecting leaves and precious seed and twig debris to decorate the floors for you. 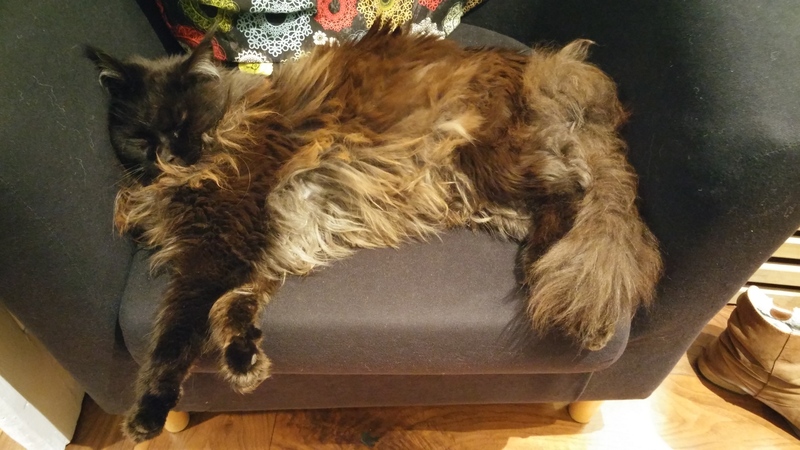 To the detriment of my glossy coat, even. So I really don’t expect you to respond so thoughtlessly by awakening this monster of all things evil to collect them up. Horrors! I just need something from outside. I will be back later. 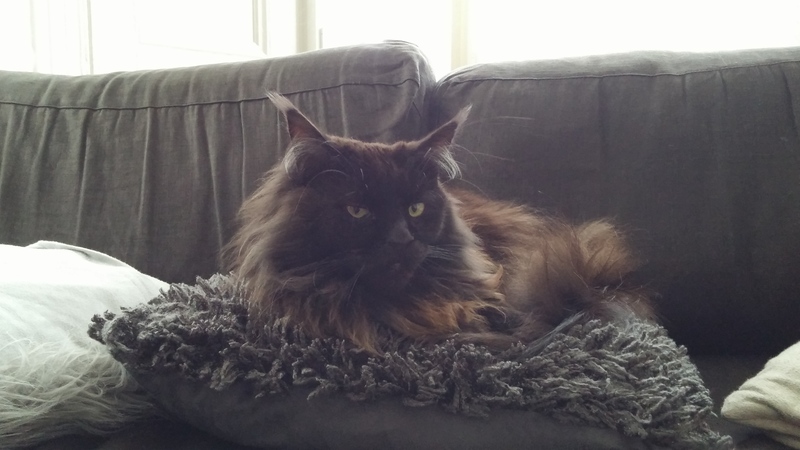 When the monster has returned to its lair. Bye! The sound of the Living Etc magazine hitting my door mat each month is a pleasing thud of promised inspiration: and June’s issue has surpassed my expectations. I recognised old friends in the form of furniture and designs, and found myself meandering into new territory entirely with some surprising meetings of colour and texture. 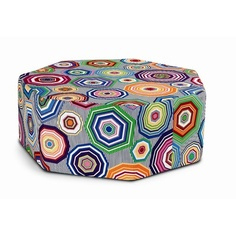 It’s a different designer and store from the one featured in my pouf! post, and I’m pretty sure you can get cheaper versions on eBay too. It looks like the word stoneware is about to take on an alternative meaning. I would love to see this in the flesh – or in the wire, or however you might want to describe it. It looks, as the name suggests, exactly like a line drawing, with the ‘scribbles’ so flat on the page. Such a clever, humorous and striking piece of design. After all that parquet obsessing a few weeks ago, I spotted it right away. Following the reminiscing, I was struck by some new and inspiring ideas. 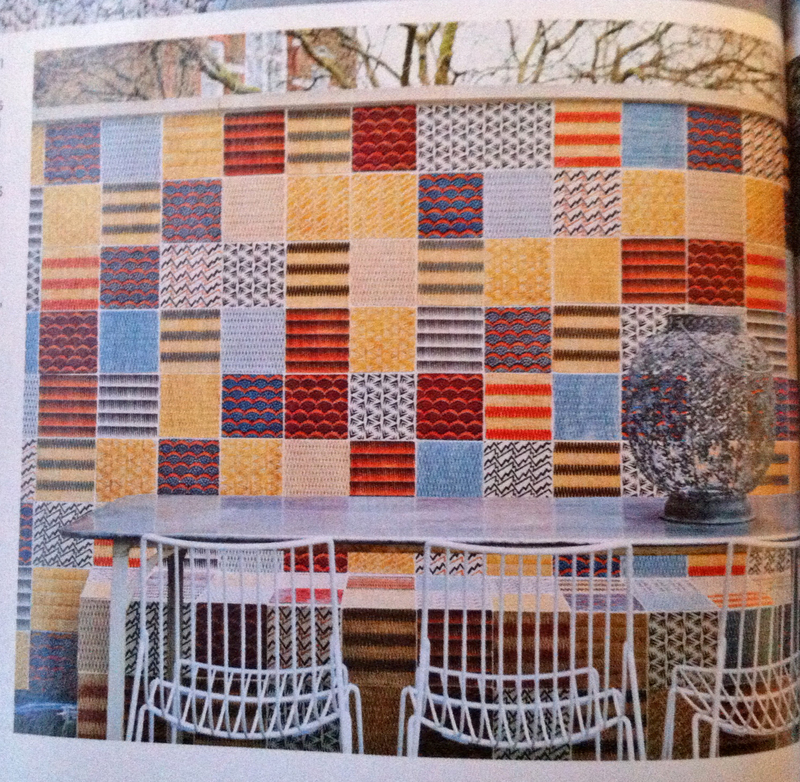 This patio wall covering is a superb endeavour: whoever said all your best house ideas had to stay inside? The tiles are by Neisha Crosland, called Navajo and made by De Ferranti. At £540 a square metre these are not a budget option, but surely this concept opens a gateway to a myriad outdoor possibilities. Dusky. A sort of pink I like. I suppose there is a lot of brown in this pink, and the shade seems quite a natural one. It also doesn’t look like it needs to remain quite as clean, which in my house would definitely be a positive. A grubbier shade of pink. 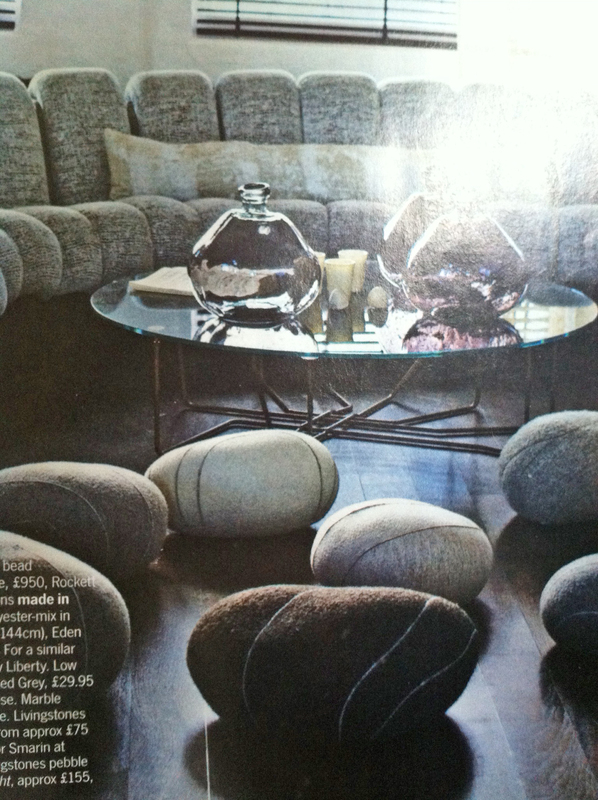 I’m still not saying I’d need to do a whole room this way. Just one item would be fine. When I was planning for our wood-effect/Japanese-inspired ensuite shower room, I kept looking out for wooden duck boards to incorporate into the shower ‘exit area.’ The problem with the products I found then was that they were bulky, very solid, and threatened to have the potential to get quite warped after a few months of soggy footfall. 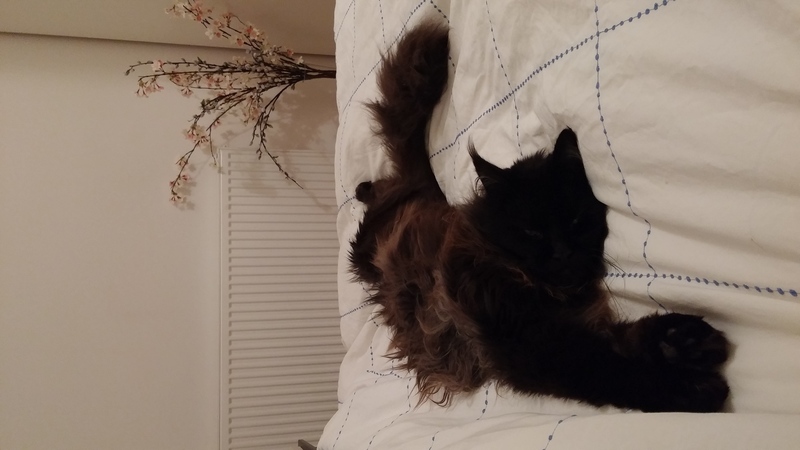 This handsome piece is a lot more subtle and flexible: slightly steep price for a bathmat notwithstanding. I love the following picture for the strongly veined marble, orange-toned wood, brash dark green plant and glinting copper pendants. 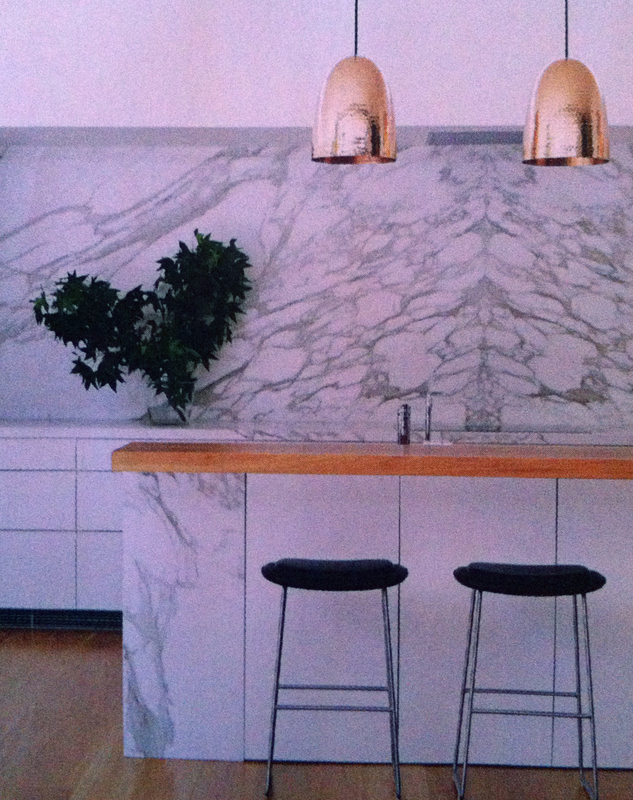 You can’t undertake a tour of any self-respecting design magazine or blog at the moment and not see marble. 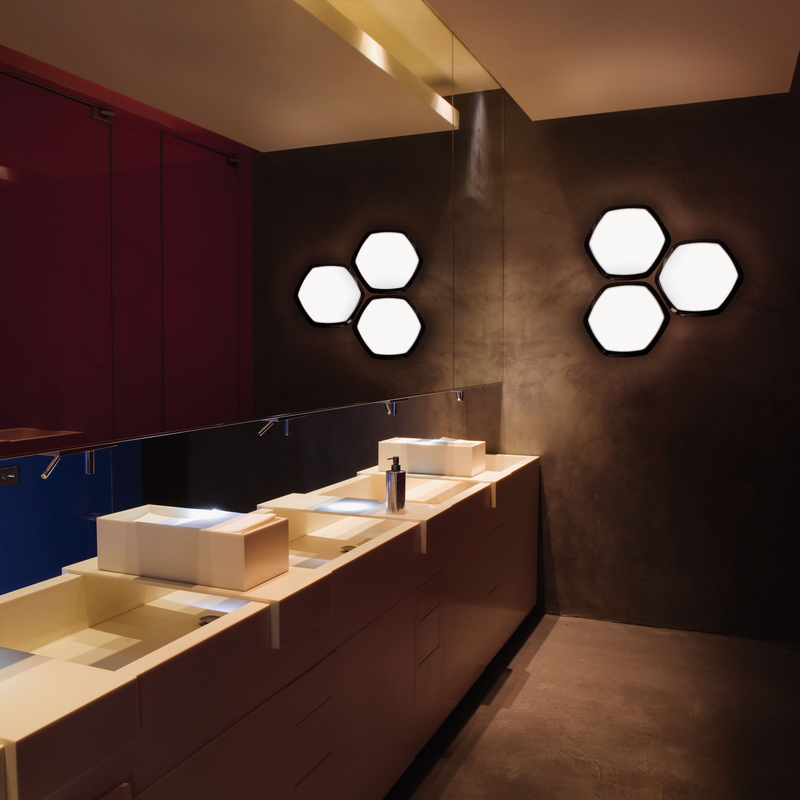 It is boldly featured throughout bathrooms and kitchens, in enormous slabs and in slivers of tiny tiles. 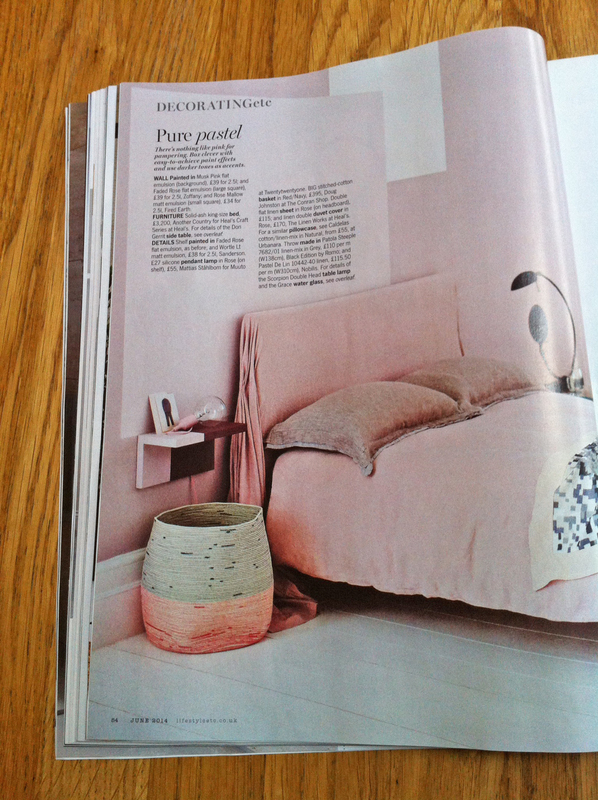 I suppose it’s a step on from the travertine and limestone shades which have populated our homes, and particularly bathrooms, and corresponds to the colour obsession of the moment. As modern paint trends have moved away from brown and yellow undertones (beiges, creamy whites, even magnolia) to the more sultry ranges of grey, so the accompanying natural materials need to fit in with the scheme. 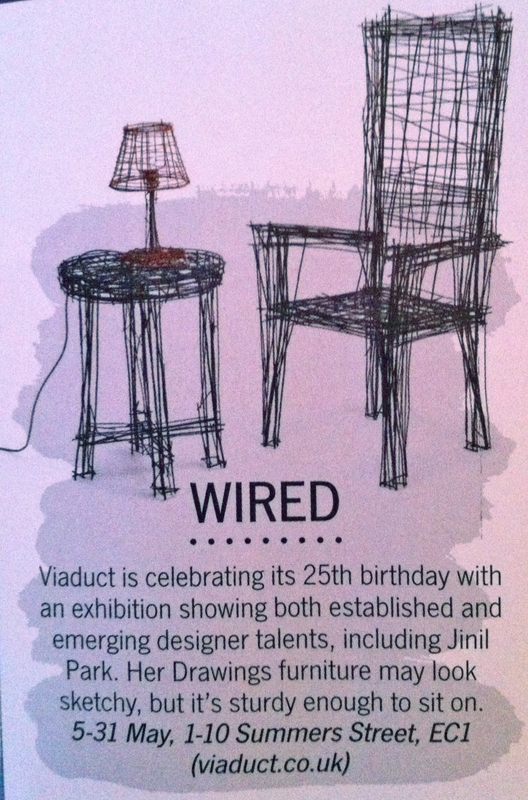 I have seen lots of excited response from designers to online interiors retailer Rockett St George’s products recently. 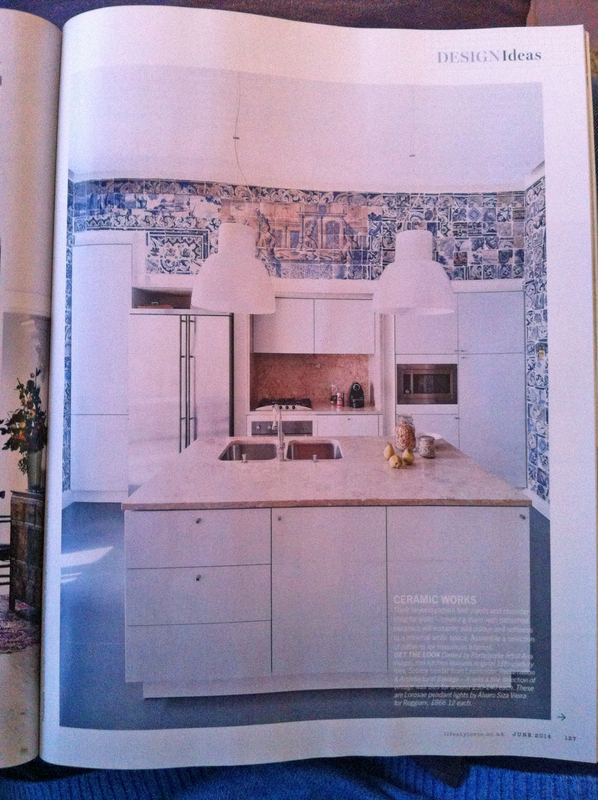 I’ve always been fascinated by the tin tiles used to glamorise ceilings, and thought they’d make a superb splashback. 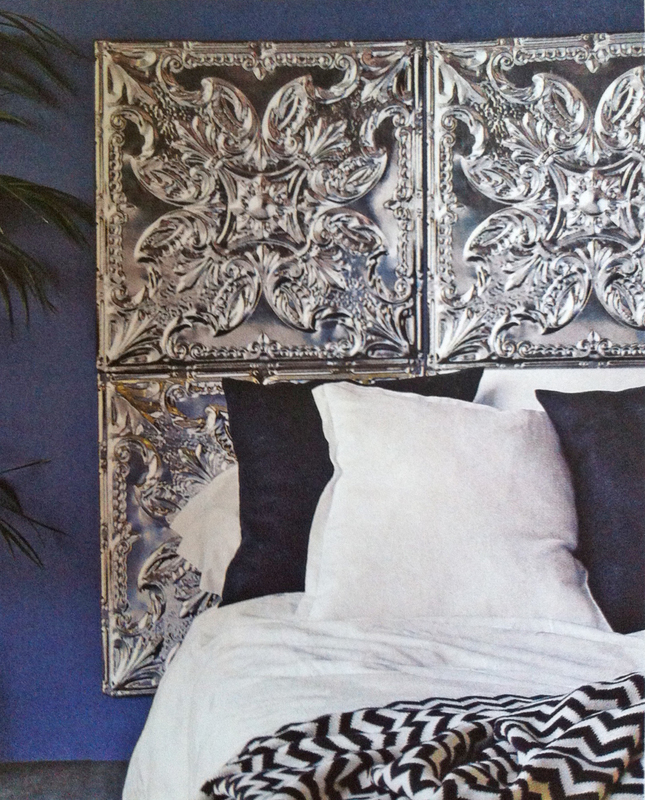 Here a bed headboard is putting on the glitz. And finally – what a beautiful kitchen! – of Portuguese artist Ana Vichgal. 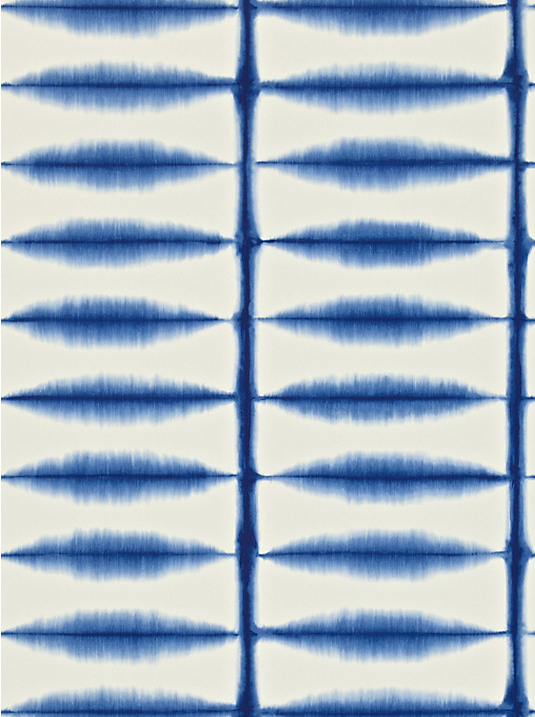 These reclaimed blue ceramic tiles are gloriously distressed, set against simple white kitchen units, delicately pale work surfaces and simple grey floor. Lots of food for thought with the creative ideas here. Thanks Living Etc for a great read! I know, it’s been so long since I last mentioned our poor old music room. 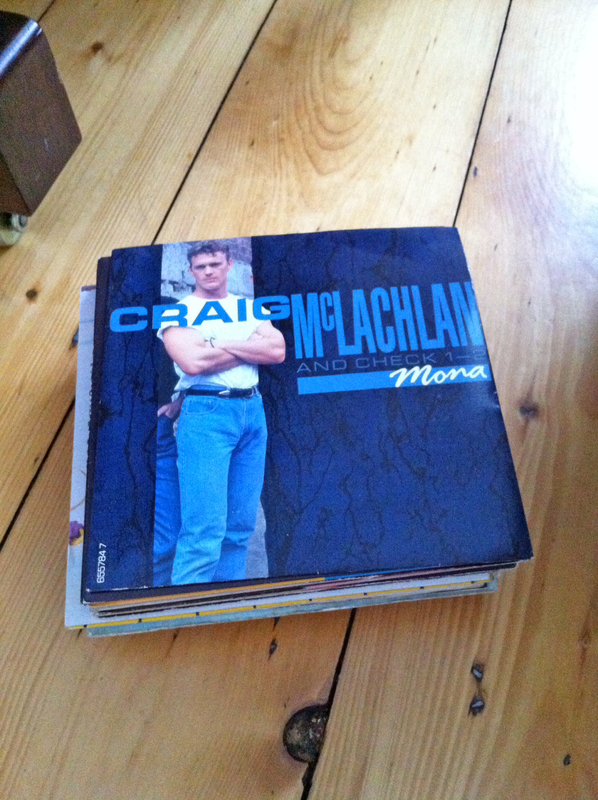 It has been languishing in dusty chaos like the Dorian Gray of our house renovation. 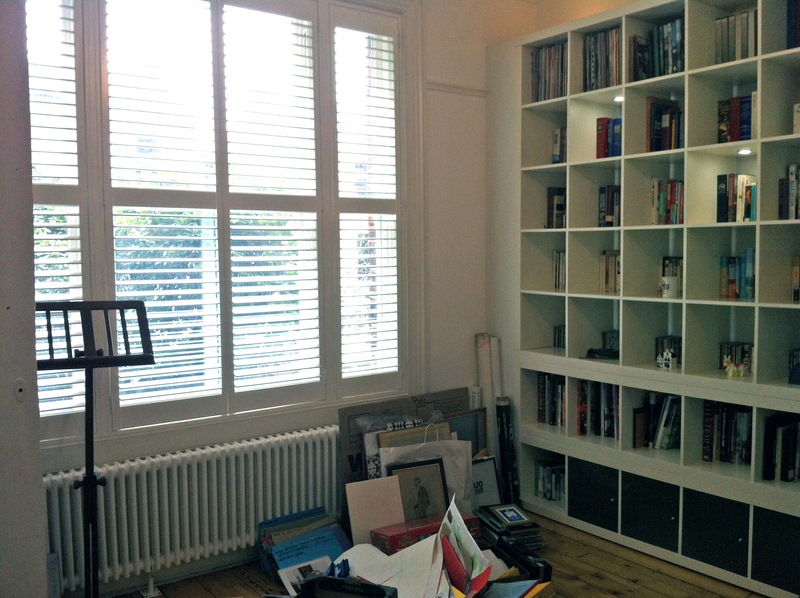 Way before we moved in, the inspired wall shelving (constructed from layered units from Ikea) was assembled and the plantation shutters were installed… and there we stopped. At the end of last year we hauled all the old boxes of CDs and books up from the cellar so that we “wouldn’t forget about them,” and then promptly forgot about them. You might remember some dalliance with wallpaper which I had before Christmas. In the end (despite how much fun it was to consider all the options) we didn’t go ahead because we hadn’t really got a picture of the rest of the room yet. However somehow, in the meantime, we have, and it is all finally coming together. A spurt of organisation this weekend has meant that I have built in some natty drawers and doors to the bottom rung of shelves. 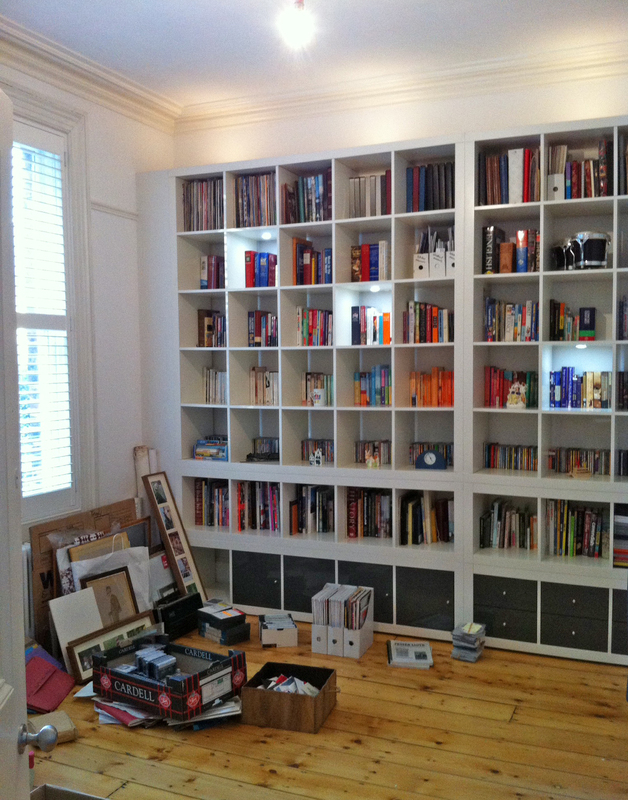 We were motivated by the news that Ikea had decided to phase out its storage system called Expedit. This cube-inspired shelving icon has had an illustrious life, as likely to be found nestled amongst the reclaimed furniture of hipster apartments and practically attired family homes: lauded for its boxy good looks and functional design. The cubby holes are the exact right shape to file away your old-school vinyl, display flowers, pack full of books or even put a colourful storage box to stow away those less sightly items. 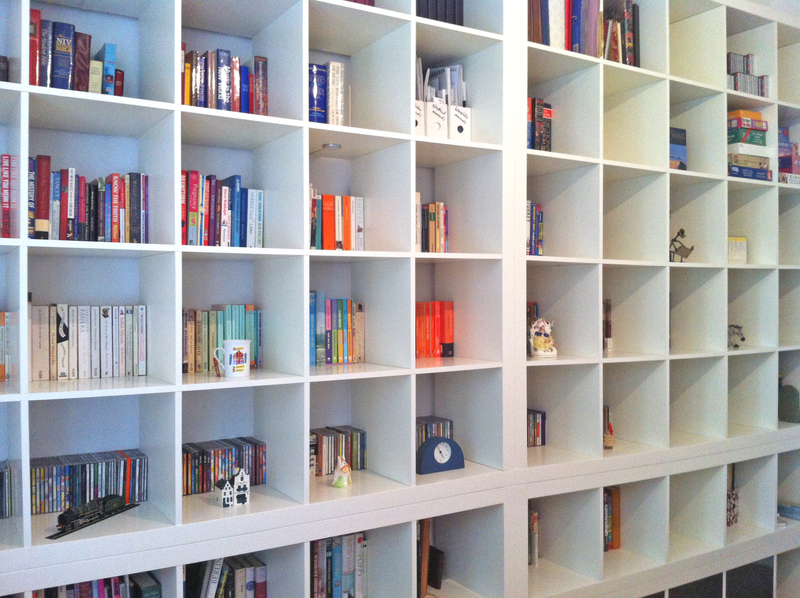 So we heard this ‘end of line’ news with a small twinge of horror, having covered one entire wall of the music room with Expedit, in the manner of (but much cheaper to execute than) a full sweep of bespoke shelving. Despite the wonderful resource of a whole website of helpful Ikea hacks it took quite an involved session of planning to find the right combination of given units to arrange against our wall. We had meddled around with the 4×4; 5×5; 4×2; 5×1 and 2×2 configurations before plumping for four horizontal 5×1 units stacked two-high, topped with a couple of mammoth 5x5s. A smattering of LED lighting in odd shelves makes a nice random effect, and a few bulbs point up to the ceiling above the unit, illuminating the plaster mouldings. 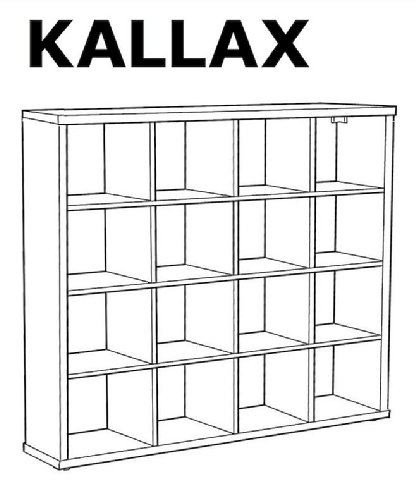 For environmental reasons Ikea have decided to introduce a less chunky replacement to Expedit, called Kallax. This will apparently be slimmer around the frame (thereby using less wood) but otherwise sport the same dimensions. 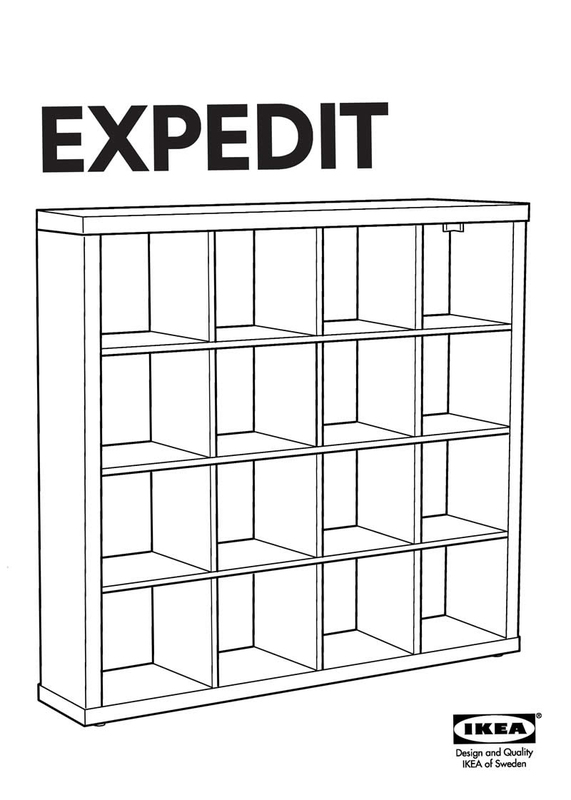 The associated boxes, drawers and doors sold in the same range will supposedly be interchangeable with, and still fit, both Expedit and Kallax units. Be that as it may, we didn’t want to get stuck with a wall full of shelving which we couldn’t accessorise, just in case there were slight variations. I sped out to buy up the stock we needed, and came back with boxes, doors and drawers. In our house, the past few months have seen a flurry of (frankly previously inconceivable) CDs sales activity, that has resulted in a very reasonable remnant of a collection. 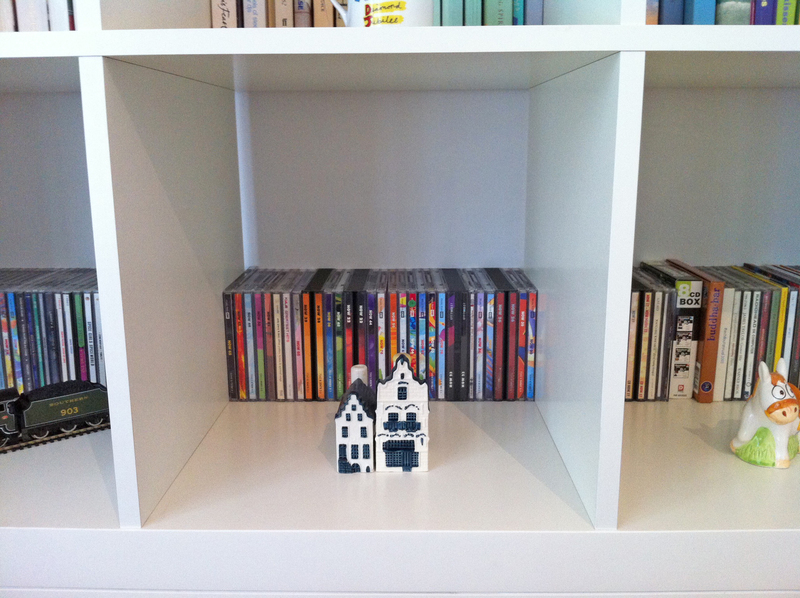 In previous properties we have had to consider the vast CD population as part of the overall design: a great swathe of custom shelving and substantial square metre-age in storage taken up with the 80s pop bands, the rave mixes and dance compilations and Best Ofs. I think we now agree that the new streamlined stock is much easier to accommodate, after the cull/massacre/clear-out since Christmas (appropriate noun to be selected depending on your point of view). We were hoping to house the survivors in the drawers, and they do fit, but sadly not so that you can actually read what they are. So they get a reprieve, and their very own line on display. We also executed a quality control exercise with the fiction paperbacks, donating those we weren’t too fussed about and creating a happy rainbow of favourite novels with the ones which we kept. Colour grouping is a smart way to arrange books, as long as you are not too fussy about knowing where any one individual volume might be. In this form they seem to provide just as much of a decoration in the room as if we’d gone at it with a paintbrush, only with quite considerably less effort. 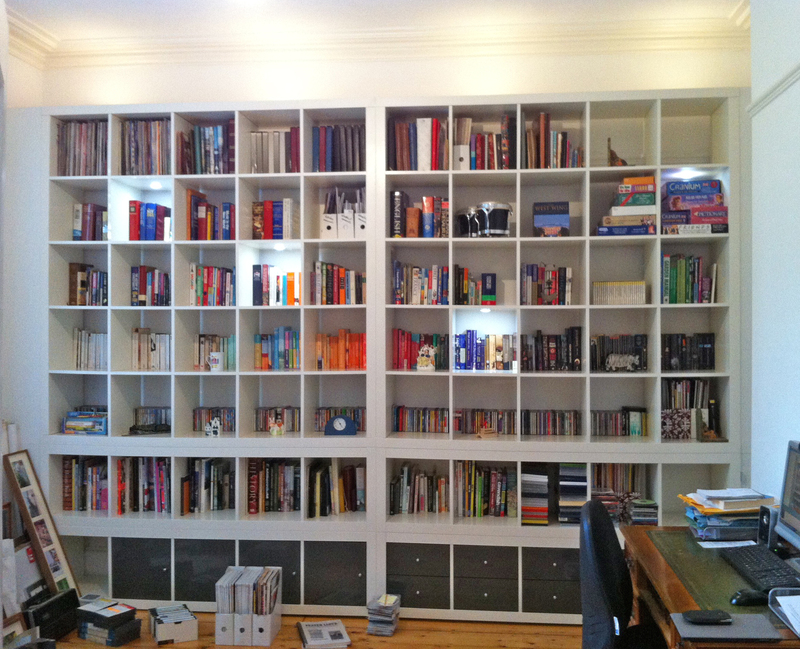 The reference titles are coralled by subject matter on the upper shelves; photo albums occupy the top flight. There is even a two-cubicle section in the gods where the LPs live. The 7″s are still lurking on the floor at the moment, awaiting their fate. Craig, will you make the final cut? Only a few empty spaces remain, and we’re nearly there with the sorting, only a few homeless items still to place, and for the first time in a while we can actually see most of the floor. 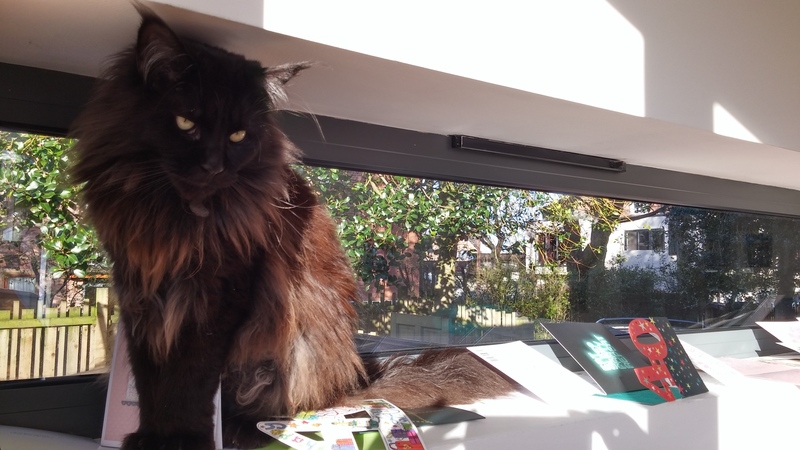 I have spent the winter months huddled at my computer whilst the files and scrapbooks have slumped in cosy privilege against the radiator. Now we can reach the shutters to let the sunlight in, and the space is starting to feel bright and ordered. Next on the list are lamp shade, rug and that wall covering. 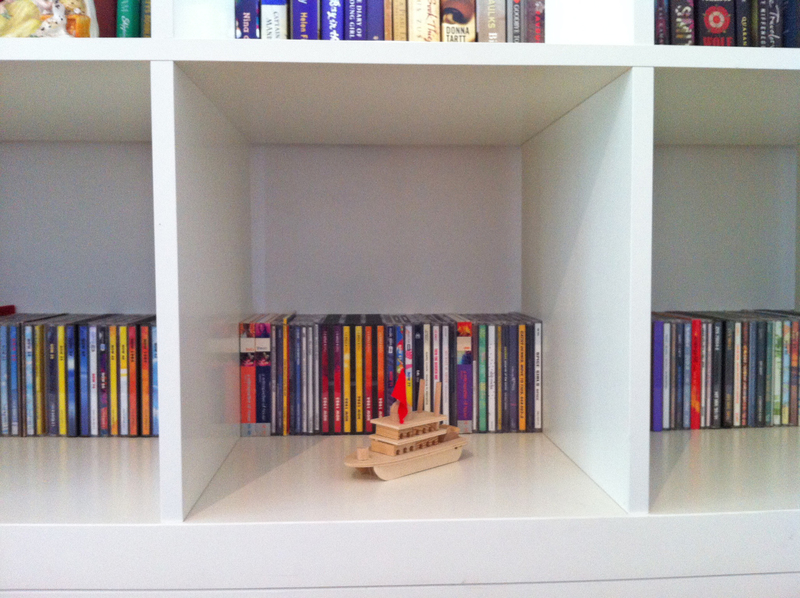 I’ll bring you news on that soon, once we’ve fine tuned the shelves…. In the meantime, how do you store your stuff? Do you like acres of display, or do you prefer to shut it all away? In strict order or mix and match? 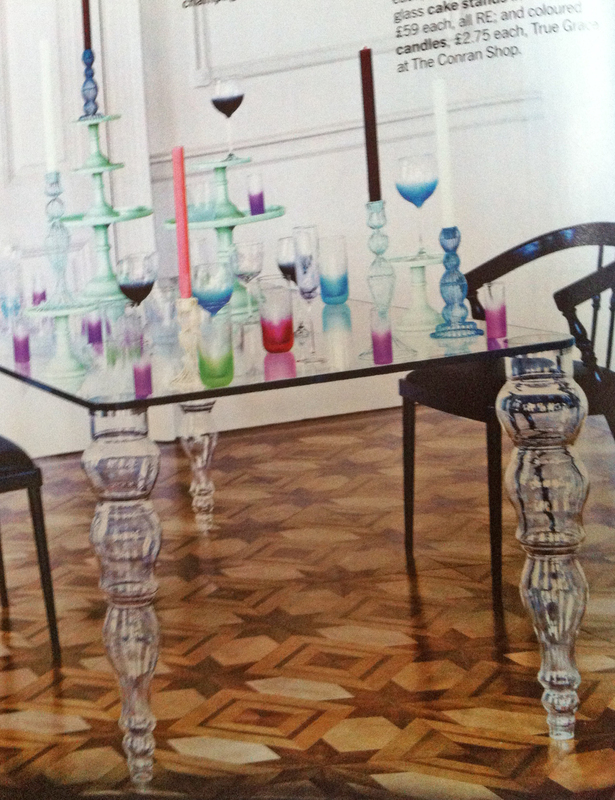 I know that dipping furniture is so 2012, and I am not going to patronise you with a selection of pictures, or pretend that it’s a new trend. 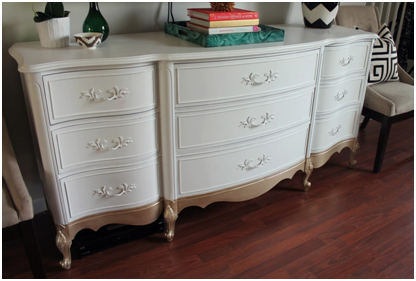 If it happened to pass you by, you can get a very quick summary by typing ‘dipped furniture’ into Pinterest. Or even any search engine, for that matter. However, I have always found it rather charming to see chairs nonchalantly kicking back under a table, pretending they haven’t been recently been trespassing into nearby paint pots. Or a sideboard that looks like it paddled too deep in a river of gold lacquer. It’s clever because it’s funny, and because it is the opposite of reverent. I also happen to think it’s clever because I doubt I could recreate this lovely, precise technique in the manner of good DIY or Etsy practitioners. A few months ago I got a really sweet old fashioned school desk for Malachy’s room in one of our local charity shops. Part of me would love to have a go at dipping its little feet in some light blue, just to see how it turns out. But maybe I am project averse, and prefer to admire from afar…. 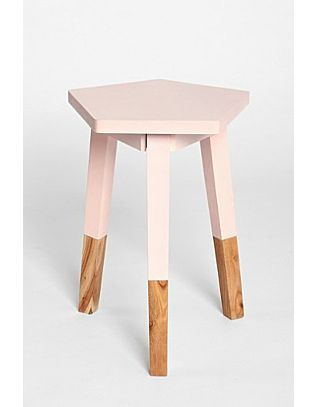 A couple of weeks ago, my sister sent me this cute pentagon stool, dressed for springtime. I enclose it for you as a postscript to my earlier taking sides post. If you are going to go the tiling route for your kitchen, and feel like a change from the pretty but neutral metro brick, how about this? 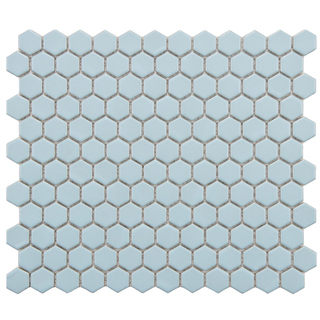 Hexagonal mosaic tiles bring a quirky slant to a surface, and this delicate blue would be right at home with a grey themed industrial background or in a pretty cottage kitchen. As luck (if your budget stretches, that is) would have it, Fired Earth‘s ranges of tiles have a few delectable examples in mosaic and larger form. Look at the way they have used a mid-grey grout in this design. 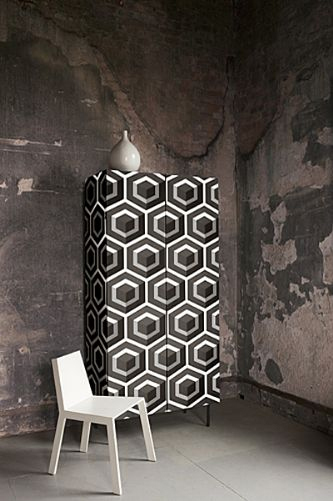 It softens the abruptness of the black and defines the borders of the individual tiles. 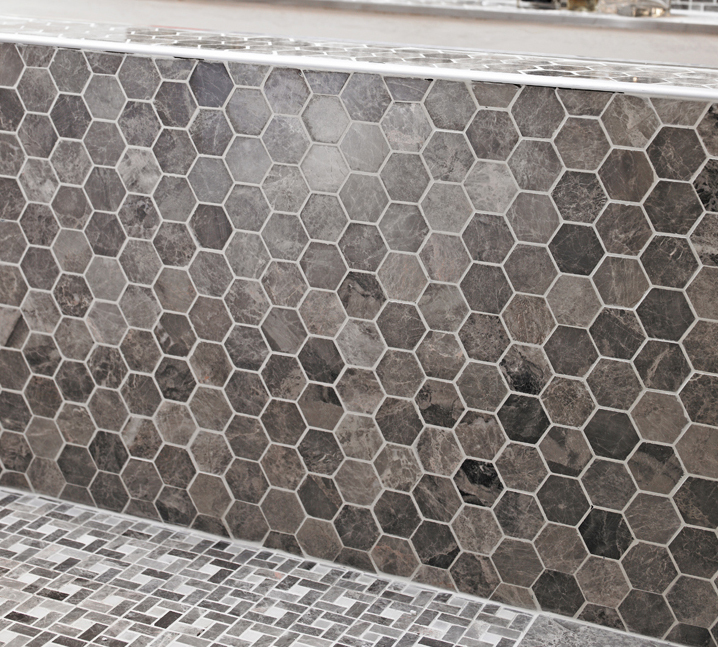 This range of larger individual tiles has a more muted, natural colour range, and the edges are softer and less sharp. 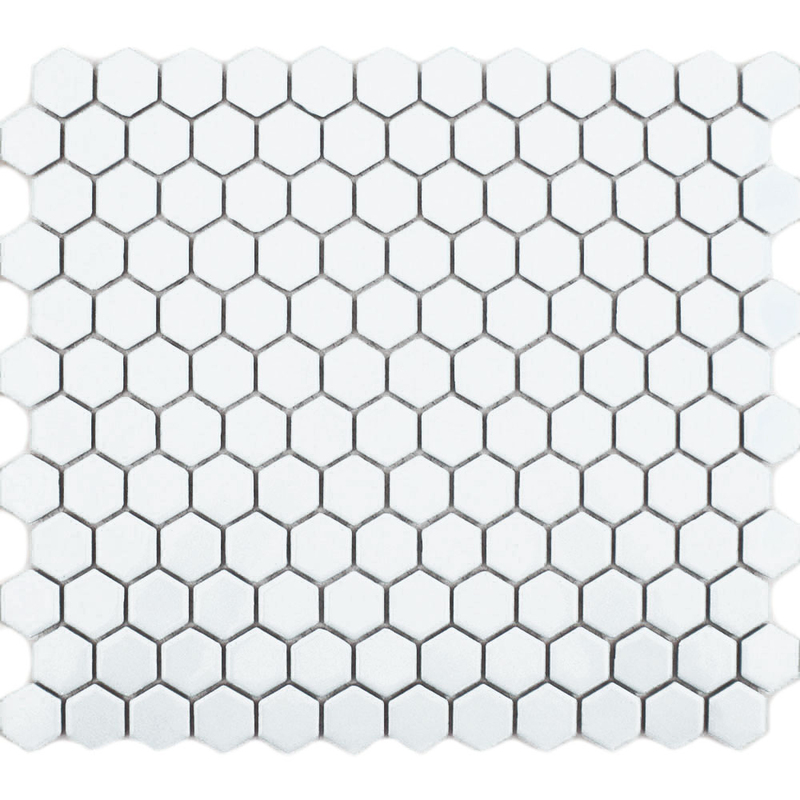 At the moment the budget range offerings are expanding rapidly — Walls and Floors have some nice white or black mosaics: or chequerboard designs if you prefer. 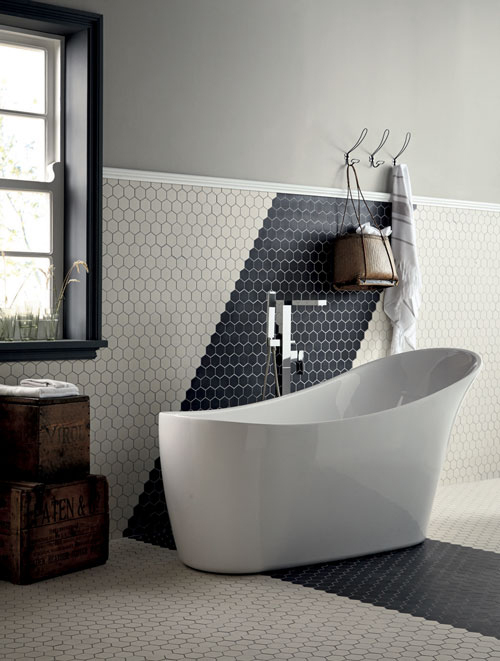 By no means budget, but nevertheless a characterful tile, is Topps Tiles‘ grey hexagonal, Mira. The shift from four sides to more is a tiling theme I am very happy to recommend, but it doesn’t stop at tiles. Once I had developed my shape awareness, I started seeing hexagons in many settings. 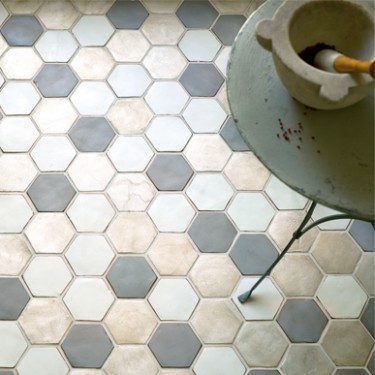 See the linked hexagon table in the foreground of this Porcelenosa room layout? 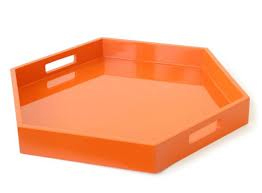 Because a little bit of orange does make me smile. How about you? Have you set aside the regular square for a more shapely option? I’ll keep you posted on multi-sided inspirations — let me know any which catch your eye. I had a great week last week setting up a friend’s kitchen makeover. I can show you photos, we’re both really pleased with how it turned out — more on that very soon. But it almost didn’t happen at all. 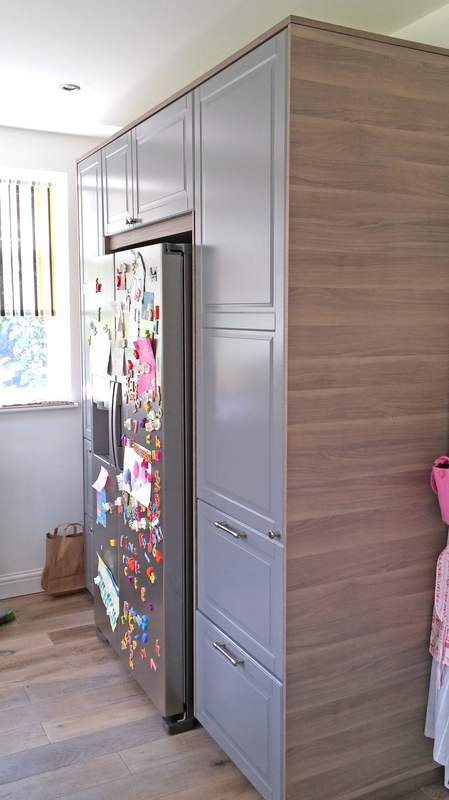 As we chatted before Christmas, she admitted that she’d love a change in her kitchen, but that it would probably cost too much, she couldn’t bear the hassle and simply didn’t have time. Working full time, with a family and many other pressing commitments besides, the prospect of wading through product research, builder-selecting and overseeing a project was an incredibly unattractive one. So we talked through what she’d like, ideally, and what would induce her to go ahead. And as we discussed it, I realised that a lot of people feel the same about making changes to their homes. Sometimes you know exactly what you want done to your kitchen. 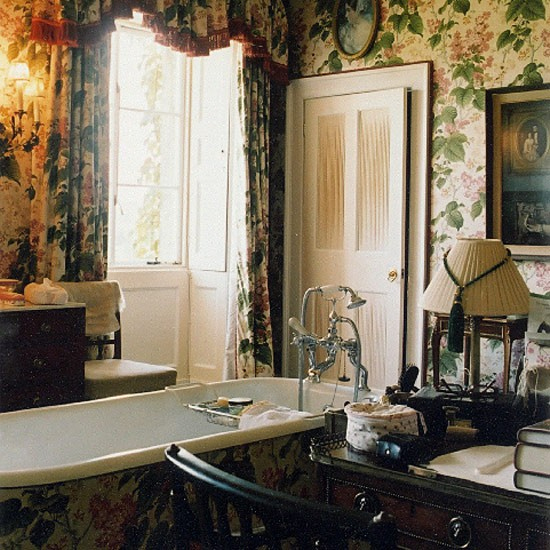 You have seen the perfect bathroom in a magazine, and you only wish you could snap your fingers and have it. Maybe it is simply that you prefer things sleek and don’t want to have all your cookware on show. 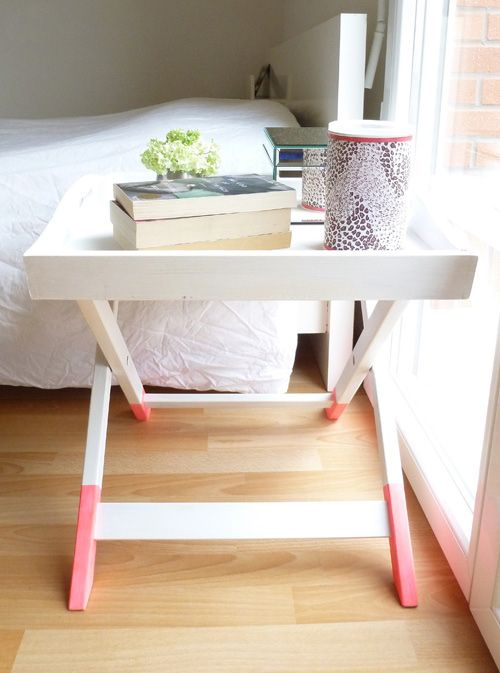 It’s a big jump from these statements to finding the right products, at the best prices, to fit in your rooms. Wouldn’t it be good if there was someone who knew exactly where to look for the special deals, could discuss the pros and cons of different items, and could ensure that everything fitted together properly? Sadly cowboy builders are not unheard of. Most people can recount horror stories of jobs left half done or how poor fitting led to leaky ceilings, wonky cabinetry or worse. But there are plenty of fantastic craftsmen out there who work hard, and create beautiful homes. A good professional recommendation is so valuable. If you are working and/or out of the house in the daytime, a simple building job can be a huge pressure. You need the time to talk through the job and get quotes, then be ‘on site’ throughout to check on progress, and keep works on track and to schedule. Imagine if someone took all these pressures out of your hands! Most people think of an interior designer as someone who swans about in houses making airy decisions about fabrics, colour ways or recommending expensive luxury furniture. They seem the preserve of the rich, not those with limited budgets seeking practical solutions. In fact, if you recognise some or all of the sentiments I’ve mentioned above, it’s almost certain that you can save your time, money and stress by employing someone to take these jobs on for you. Sourcing, tendering and project management are all areas of building work that are often bewildering and exhausting. It is not surprising that most people are nervous to undertake new projects, but if they could save on the cost of products, have peace of mind on their choice of builder, and not get embroiled in the minutiae of the job, maybe they’d feel differently. 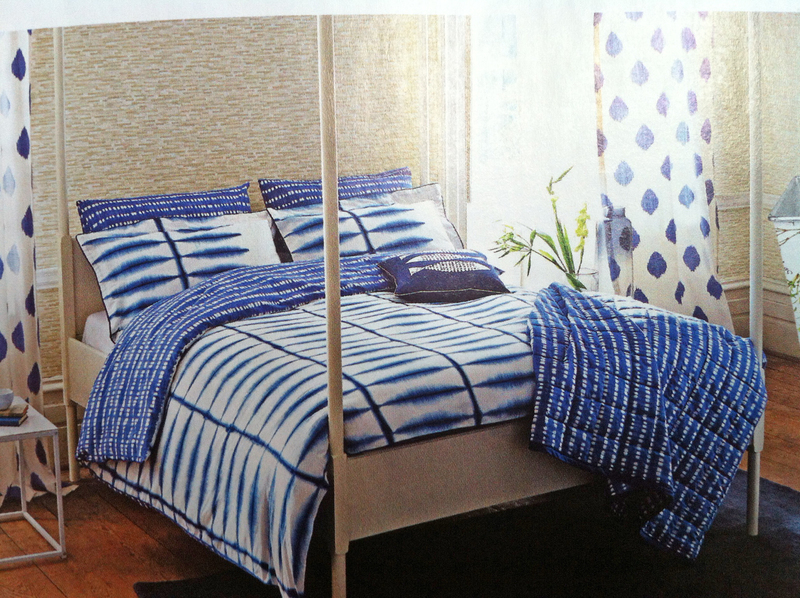 So if you’d like to spend less, not more, you probably need to come to stowed for some skinterior design. I’m freshly inspired to narrow down my wallpaper favourites because I’m going to get some as a present for Christmas: thanks Mum and Dad! I’ve decided to plump for the chimney breast wall in the music room first, because that room really needs some care and attention. I haven’t shown you pictures yet because, frankly, it’s a bit of a dumping ground — piles of framed pictures and photos, a languishing ex-computer and redundant Christmas decorations are getting friendly with the remnants of a huge eBay sell-off we recently undertook. And there are five huge boxes full of CDs which Tim is gradually pensioning off to retirement websites like Music Magpie. The floorboards are a lot clearer than they were a few weeks ago, but I think we’ll wait a little before the big reveal. I promise I will take before and after pictures though, so that you can see the scope of the transformation. So, I bring you the shortlist. One of my first loves was a cityscape. I think this design sparks the imagination because you can never quite be sure what is behind all those buildings, and the busy jumble of city life is evoked so well. I’d never get bored working in front of this. But maybe I would get distracted. Stepping up a price bracket is my favourite city view, made originally by Piero Fornasetti in the 1940s for the entrance hall in his own home in Milan. 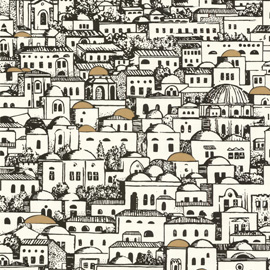 This stately roofscape features gold accents and beautiful stately ink drawings. The regular buildings and formal layout bring an entirely different sense to the wall. A visual representation of Classical music: order and form. Since the room is a working space, we were taken by the trompe l’oeil papers featuring bookshelves: there is even a Penguin paperbacks version. 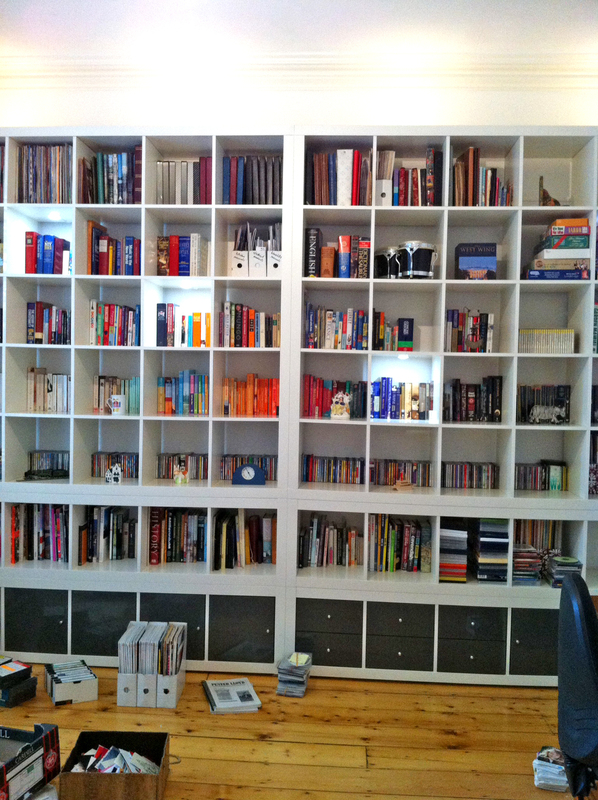 But we have a wall of books already in the room, and I do think that they are striking enough, without pretending we actually have a whole new set elsewhere. I haven’t ruled out the possibility of including this sort of paper on a door somewhere: possibly the one to Caspar’s room, which we haven’t yet painted. Yes! I know! £195! Before you choke on your mince pies, I can console you with the news that in fact this is a photo mural wall covering which comes complete in a roll of four 2.79 metre drops. 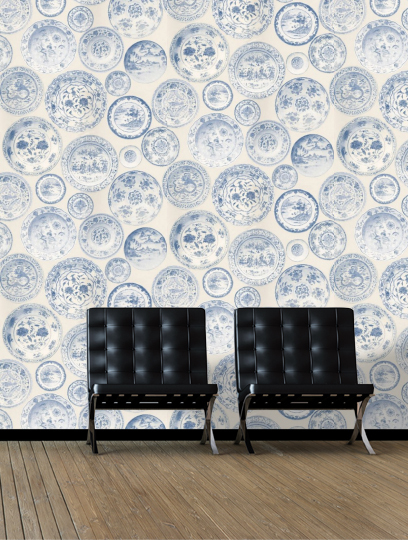 So the price is for the overall mural, not simply a roll of wallpaper. But still, I don’t pretend this is a cheap option. 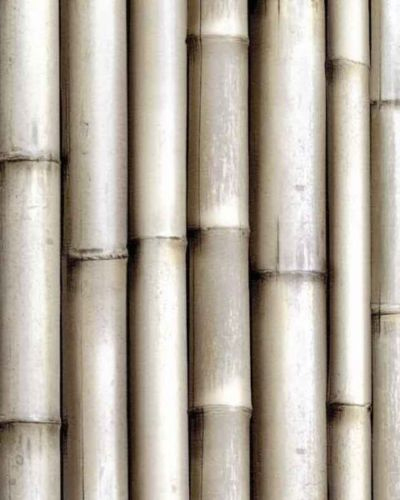 A nice bold photographic representation of vertically stacked bamboo poles. 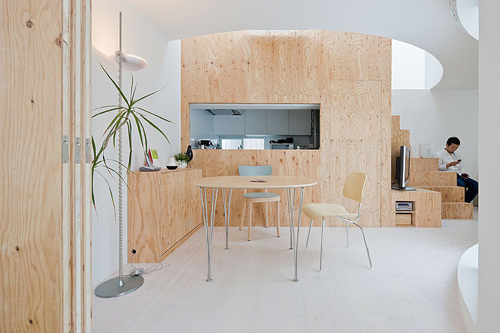 I like this for its simplicity and modern Japanese feel. I’m not sure where I’d put it in our house though, unless I could find a spot in our ensuite shower room? A little trend I have noticed of late is for displaying plates on a wall. These are often unashamedly kitsch and twee, but placed in a block or along a mantelpiece are strikingly modern. Little surprise then, to find you can skip the charity shop searches for suitably ironic plates, and simply deck the walls with illustrated platters instead. 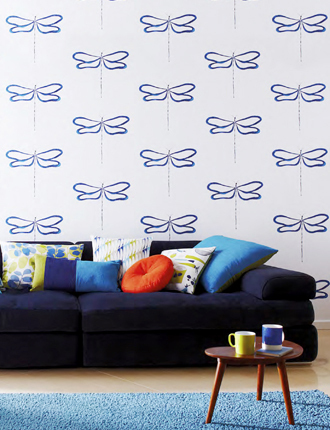 These delicate insect sketches in rich indigo would make a fantastic statement on a big wall. 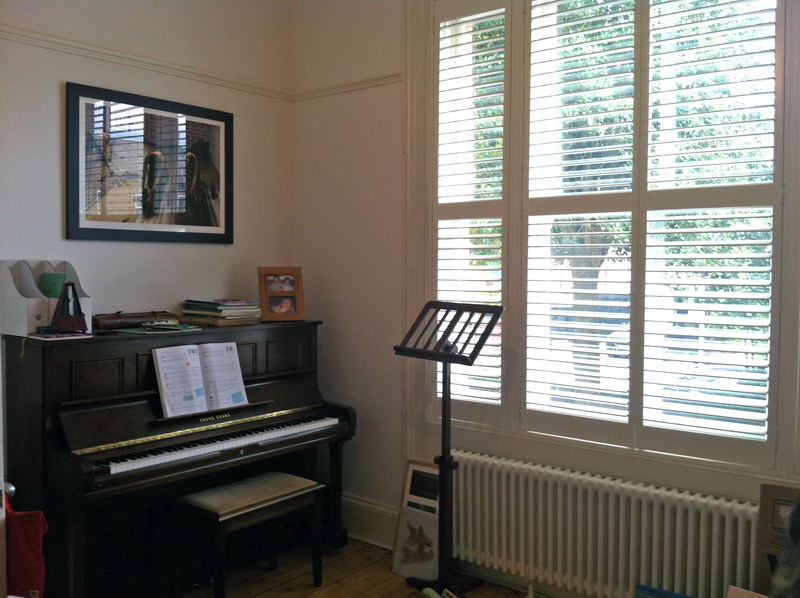 Part of the reason why I think this pattern will work so well in our music room is that we have white wooden shutters at the large window, and they are directly opposite the wall I’d like to decorate. So creating an abstract ‘reflection’ seems quirkily apt, yet in keeping with the clean lines of the rest of the room, and the expanses of white painted woodwork. I’ll get work started in the New Year. How about you? 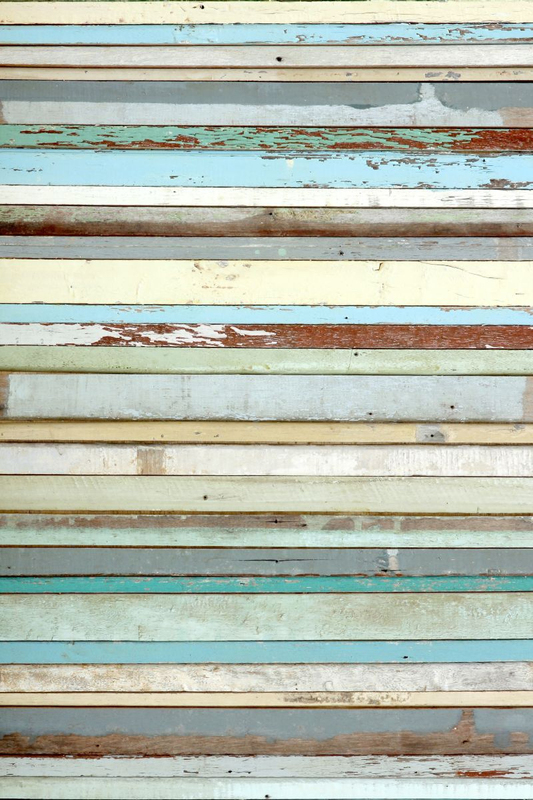 Do you have any walls calling out for a bit of colour or character?